CAMPBELL, CA--(Marketwire - September 27, 2010) - Market research firm Infonetics Research (http://twitter.com/infonetics) released its updated 2010 Policy Servers market size, share, and forecast report, which tracks policy management software deployed in 3G broadband, WiMAX, and LTE wireless networks and in fixed line broadband and cable broadband networks. "Policy management has really taken on a larger role within the operational environment and is increasingly being integrated with adjacent capabilities, such as charging, subscriber data management and performance management. The market continues to mature, as evidenced by Tekelec's acquisition of Camiant earlier this year, and we will see additional M&A activity going forward, with larger network and IT suppliers looking to round out their product portfolios with the capabilities of some of the smaller, more innovative policy players," expects Shira Levine, directing analyst for next gen OSS and policy at Infonetics Research. 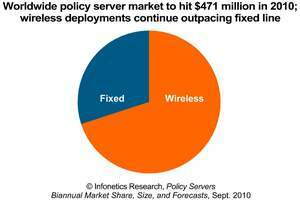 Infonetics' Policy Servers report provides worldwide and regional market size, market share, analysis, and forecasts through 2014 for fixed line and wireless (3G broadband, WiMAX, LTE) policy server licenses and manufacturer revenue. Market share is provided for Alcatel-Lucent, Bridgewater, Ericsson, Juniper, Nokia Siemens, Openet, Tekelec (Camiant), and others. The report also tracks policy server products manufactured by BroadHop, ComAbility, Elitecore, Kabira, Openet, Redknee, Telcordia, Unipier, Volubill, and others.